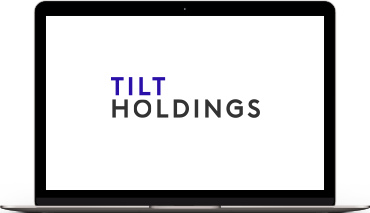 TILT Holdings Inc. ("TILT") is a vertically-integrated technology and infrastructure cannabis company. The TILT vision is to provide value to all cannabis retailers through software, infrastructure, access to capital, and more. The cannabis industry still faces numerous challenges that are impeding the ability of businesses to effectively deliver products and services to a large and growing demand base. TILT offers comprehensive operations and software solutions at each touchpoint in the supply chain, from vertically-integrated operations to cutting-edge genetics and business technology solutions. Serving more than a third of dispensaries across the US and Canada, TILT helps dispensary owners better serve their patients and customers by providing them the tools to communicate, operate, and scale with a greater degree of efficiency. Well-positioned to support the rapid growth and demands across the industry, TILT intends to broaden its capabilities through a pipeline of infrastructure expansions, acquisitions and partnerships with the goal of delivering the highest quality products and services where laws permit.